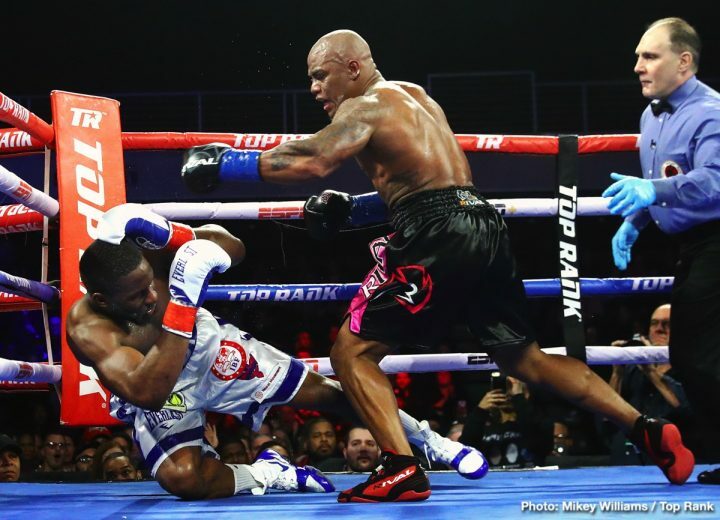 By Cole Johnston: Oscar Rivas’s (26-0, 18 KO’s) 12th round stoppage win over Bryant Jennings (24-3, 14 KO’s) this past Friday night may have some boxing fans wondering how Rivas would fare against some of the best current heavyweights in the world right now. The Colombian fighter presented many problems for Jennings throughout their competitive 12 round bout, and, if nothing else, showed animalistic aggression and killer instinct Oscar Rivas in the 12th and final round, which was certainly impressive to many who tuned in to this heavyweight clash on ESPN+. With Oscar Rivas picking up a stoppage victory in his first real test against Jennings, many boxing experts and fans may start envisioning how Rivas would fare if put back in the ring with another top tier heavyweight. Oscar found himself in a unique position on January 18th, in Verona, New York. Oscar stepped into the ring as a sizeable underdog for his bout with Jennings, with many boxing fans thinking that Jennings’ reach and experience advantage would carry him to a comfortable victory against the shorter and less experienced Colombian. To the shock and exhilaration of many in attendance, Rivas came out of his corner for the 12th round with evil intentions. Within a minute of the final round, Rivas managed to knock-down Jennings with hard and powerful shots that landed clean on Jennings’s chin, and then managed to put Jennings away when Jennings became unable to defend himself due to a barrage of clean punches by Rivas. The Verona crowd was stunned, but also exuberant by Rivas’s ability to show a level of viciousness seemingly out of nowhere. With Rivas’s win over Jennings, Rivas puts himself in the same category as Wladimir Klitschko and Luis Ortiz, as the only 3 men who have been able to defeat Bryant Jennings. Does this mean that Oscar Rivas could possibly establish himself in the future as a top 10 heavyweight? Maybe. Maybe not. On one hand, aside from the 12th and final round, Rivas looked quite lackluster in his fight with Jennings. Rivas wasn’t cutting off the ring as well as he probably should have, and for a few rounds in the middle of the fight, Jennings was hitting Rivas with clean shots, whilst making Rivas miss most of his power punches. On the other hand, Rivas displayed a very strong ability to put his opponent away in the 12th, not letting the reach and size advantage of Jennings get the better of him. This win was especially valuable for Rivas, as the biggest criticism against him was that he lacked a victory over a quality opponent. That changed with his victory last Friday night. He took a former world title challenger who took future hall of famer Wladimir Klitschko the distance and managed to finish him in impressive fashion. Some may even argue if Rivas had shown that level of ferocity in the first few rounds it could have been a short and easy night for Rivas. In conclusion, an argument can be made for and against the discussion if Oscar Rivas is a top 10 heavyweight. Even though Rivas only has one quality victory on his resume, Oscar showed that he has the potential to knock out almost any heavyweight he faces if he can land his shots clean, and while age might not appear to be on the 31-year-olds side, current heavyweights like Luis Ortiz and Kubrat Pulev, are seeming to have their best years in their mid to late 30’s. Only more time and more fights against strong opposition will tell if Oscar Rivas is a top 10 heavyweight. If he can improve his footwork and ring generalship, and channel that animalistic instinct more often, Oscar Rivas has the potential to be, at the very least, one of the more feared and avoided fighters in boxing biggest division. Boxing » News » Can Oscar Rivas become a top 10 heavyweight?